Sips Cold Brew plans to deliver locally produced cold-brew coffee to college students at a competitive price. Students will receive weekly or biweekly deliveries of a 32-ounce growler, enough for four to six servings. The Sips team is led by CSULB management information systems major Conner Schnicker, who is joined by Sophia Holbrook, a Cal Poly Pomona e-commerce major; CSULB industrial design and film major Vincent Holbrook; and CSULB business administration/ finance major James Pierce. The Battery Effect, which was one of last year’s four finalist teams, offers a mobile app that will let residents find businesses where they can recycle household batteries. The team is led by Alexander Grasso, who graduated from CSULB with a marketing degree in 2017. Other team members are Abhishek Manjulagodu Basavanna, who is graduating from CSULB this year with a master’s degree in aerospace engineering; and Leon Smith II, who is set to graduate from UCLA this year with an MBA in management. The InstaVegan platform will direct customers to restaurants, grocery stores, farmer markets, and festivals where plant-based food is available for delivery or pickup. The team is led by Valentin Zachesov, who is graduating from CSULB with a business administration degree this year. Other team member are Victoria Gorodetskaya, a CSULB management information systems major; and Rodion Negov, who holds bachelor’s and master’s degrees in computer science from Russia University. All are longtime vegans. Beach Biotech plans to produce quality, low-cost medical devices that can diagnose diseases using noninvasive methods instead of through more extensive laboratory testing. The company is working on a kiosk for diagnosing Type II diabetes. Made up of students set to graduate this year, the Beach Biotech team is led by Talha Karwa, a CSULB electrical engineering major in the biomedical and clinical engineering option. Other team members are CSULB students John Aquino, electrical engineering/biomedical and clinical engineering; Marisol Bernal, chemical engineering; Johnston Hou, electrical engineering/control and system robotics; Imran Malam, business administration/operation supply chain management; and Annas Tohmeh, electrical engineering. The team also includes UC Irvine student Amanda Wu, who is earning a master’s of business administration in accounting. The competition and awards ceremony will be held from 4-7 p.m. at the Walter Pyramid at CSULB. To save your seat, register at http://www.csulb.edu/innovationchallenge. Brenda Wunsch, chief revenue officer of Scoutbee USA. 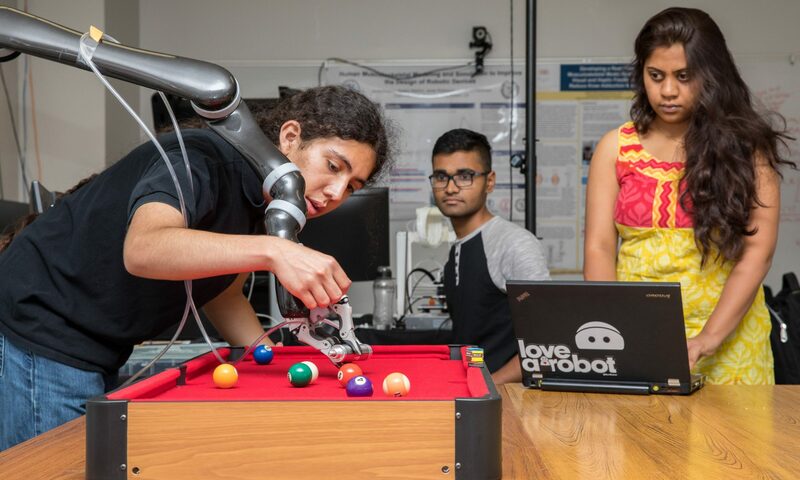 A joint production of the CSULB Institute of Innovation and Entrepreneurship and the colleges of the Arts, Business, and Engineering, the competition is now in its ninth year. Dozens of mentors from the business community give their time to support teams, and sponsors donate the seed funding and in-kind services to help the winning team launch its business.